In the past few years, the word “bento danshi” has been popular in Japan. “Danshi” means boys or men. 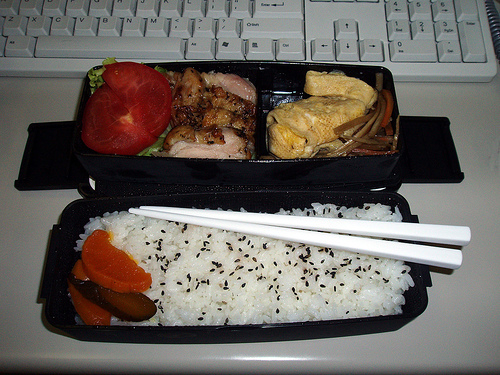 And the word “bento danshi” refers an un-married man who regularly packs his lunch in a bento box to take his office. In a wide sense, it includes any men who make bento (whether married or not). The main reason to make their own bento seems to be “saving money”. Before the depression, Japanese business men used to spend 500 yen (US$5) per lunch, but in the recent years, they tend to spend much less money. At major department stores, they have special corners for “bento danshi” and sell bento related items like bento boxes for men and business bags to put a bento box. Besides saving money, some “bento danshi” make bento to have balanced healthy meal.